Organisations need to know what is being said about them, and Twitter is one of the obvious places to find this out. I’m not looking at trawling all of Twitter but targeting tweets about the organisation or its competitors and what the organisation and its competitors are tweeting. Because Twitter data is mostly already public, and no private data is being retrieved, this investigation was also a good opportunity to explore Microsoft’s Azure cloud computing platform. Probably this is a bug: TweetSharp (or the underlying JSON and REST libraries) will cause a stack overflow (!) if trying to retrieve a list of follower IDs when the Twitter user has protected tweets; you can ensure this does not happen by checking the user’s protected status first. This entry was posted in Social Network Analysis, Windows Azure and tagged Architecture, Twitter, Windows Azure on June 24, 2013 by Robert Gimeno. 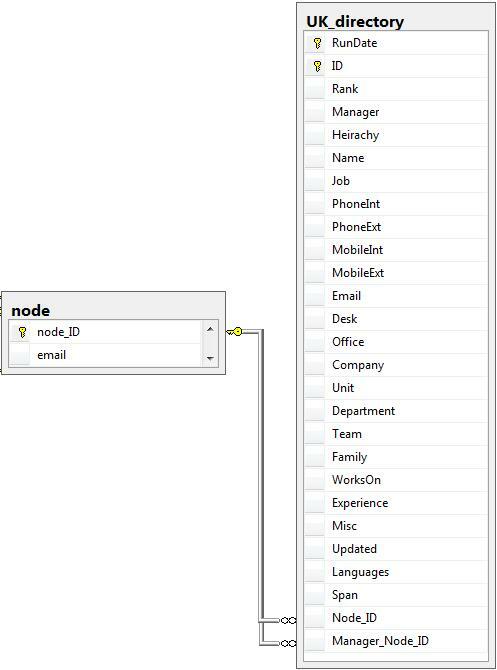 If you want to perform analysis comparing sub-sets of a graph derived from your email logs you will need to bring in some additional data, for example department. You might be lucky in that the organisations addressing scheme provides some clues e.g. ‘user1@marketing.domain.com’ or ‘user2@sales.domain.com’ but if not you will have to find another source. Now you might have an efficient HR department who could provide an extract of employees with department, role and any other data they don’t mind you having. Or they might not be so helpful. If HR won’t help there are some other sources: the directory service (e.g. Microsoft Active Directory) or maybe an intranet site that acts as a phonebook and/or organisational chart. Which one you select will depend on content and accuracy. In my case the intranet site provided both the most accurate and richest source of data. Each intranet is going to be different so maybe the following is not going to work for yours but I hope the approach provides some inspiration. A page describing the employee with phone numbers, job role, location, department and also some free-text fields allowing people to input experience, skills, what they work on and languages spoken. A Hierarchy page: given an employee it displays their manager and direct reports. Luckily each page type could be bought up by knowing the employee and manager ID and constructing a fairly simple url. This second step could be used to populate the whole list but it does not provide such rich hierarchical information. The directory information is best retained in its own table. This is because it changes over time and should be obtained periodically (e.g. monthly). However a refresh of the directory data SHOULD NOT overwrite, instead add a field that contains the date the data was fetched. This makes it possible to use directory data that corresponds to the period of data being analysed or to still derive a tie between people: if A used to manage B, even if they no longer do. Example directory table. Note: RunDate is the date the directory was traversed (there will be multiple runs in 1 table); ID and manager are internal IDs for the intranet directory; rank is the position in the hierarchy (0 highest); Span is the number of direct reports. This entry was posted in email, Social Network Analysis and tagged Architecture, email, Social Network Analysis on March 14, 2013 by Robert Gimeno.